During the winter of 1929 prospector Gilbert LaBine was in the Ottawa office of the Geological Survey of Canada searching through old geological field reports when he discovered a clue that was to change northern history. LaBine was convinced that the Canadian Shield had the right geological conditions for the presence of pitchblende. Radium, the rarest and most valuable element known to man, could be extracted from pitchblende. During the spring of 1930 LaBine and his prospecting partner Charles St. Paul traveled up and down the east shore of Great Bear Lake . It took them more than six weeks to find the small bay and the ‘cobalt bloom’ that Bell and Camsell had written about and just as predicted there was also a rich vein of pitchblende. What wasn't predicted was that the discovery would also contain silver, copper, lead, zinc and iron. Eldorado Mine and its associated town site, Port Radium, were developed at the site of LaBine’s pitchblende discovery. The mine produced radium from 1933 to 1939. 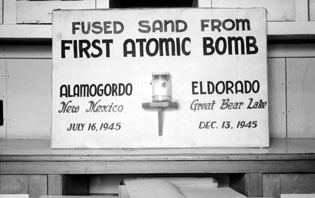 It closed at the beginning of World War II because of an oversupply of radium on the market. In 1942 the Canadian Government purchased the mine and reopened it as a Crown Corporation. While Eldorado did supply uranium to the Manhattan Project the bulk of the uranium used in the development of the atomic bomb came from the Belgian Congo. Northwest Territories’ uranium may or may not have been present in the atomic bombs dropped on the Japanese targets of Hiroshima and Nagasaki. Eldorado mine was closed in 1960 when the uranium ore ran out.